Magna Carta Recent News: Magna Carta's Dave Martone and Glen Drover Webcast Give Aways! 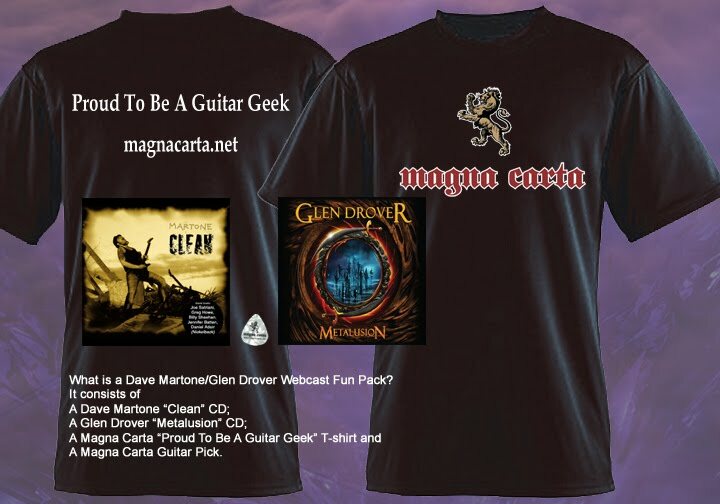 Magna Carta's Dave Martone and Glen Drover Webcast Give Aways! The live webcast featuring Magna Carta artists Dave Martone and Glen Drover “Live At Metalworks” was a HUGE success!!! With visitors from 4 continents, 10 countries and thousands of hits during the webcast, Martone and Drover gained many new fans. As a result, the Dean Guitar/D'Addario/Planet Waves has had THOUSANDS of entries. We appreciate all the interest and support that you have shown in this promotion. To make things more interesting, Magna Carta has decided to make the contest more interesting by adding more prizes to the fun. Magna Carta will add 10 Dave Martone/Glen Drover Webcast Fun Packs to the prizes that can be won in the contest. What is a Dave Martone/Glen Drover Webcast Fun Pack? It consists of a Dave Martone “Clean” CD; A Glen Drover “Metalusion” CD; A Magna Carta “Proud To Be A Guitar Geek” T-shirt and a Magna Carta Guitar Pick. And to make things even more interesting, Magna Carta will send 5 of the Fun Packs to winners outside of the USA. So, more winners equals more fun.